With all the nice weather, we decided a day at the beach was in order. 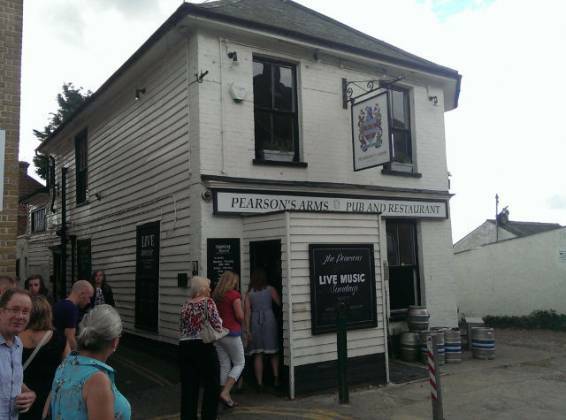 I found Pearson Arms by Richard Phillips in Whitstable online – I booked for Sunday through the website. It was right on the sea wall, so could be interesting. We arrived early to Whitstable (parking can be atrocious in the area) and had a nice walk around the harbour. I requested the table for 12pm. The pub looked a bit ram-shackled from outside (in my opinion, although Claire didn’t seem to think so). The inside was nice though, with a large bar and a restaurant at the end (under the stairs). We found someone to speak about our table and directed upstairs. Struggling with a pushchair up a flight of stairs wasn’t fun; when we got to the landing, we had another set of stairs to the restaurant to contend with! They did (a number of times) request I leave the pram on the split level; John William was 6 months old and we tried the available highchair but it was not clean so we felt it was best to bring it anyway. Our table was next to the window, and nicely laid out – linen napkins, wine glasses, cutlery and flowers in a jar. Adorned on the walls were pictures of food and beach / sea scenes as well as lantern lights. The walls were either painted cream or covered in wood, and wooden floors with large rugs. There was a fireplace behind me with stacks of chopped wood. Oh, and the view from our table was by far the very best we have ever had. Menus were nicely presented, and they had some good choices available. Two things I appreciated: 1) you could order individually priced courses, or pay £19.95 for 3 (a large saving on some items, more later) and 2) children under 7 ate free! Whilst we wouldn’t be ordering for John William, these kind of options make restaurants more accessible to families and keep costs down. The children’s menu did include roast beef as well as good choices too. After a bit of deliberation, Claire decided to order the “Eggs Benedict, Honey Roast Ham and Truffle Hollandaise” for starter and “Braised Wild Boar, Gratin Potatoes, Scented Foraged Wood Mushrooms with Kentish Cider Jus” for main (it’s ok, as they only had one Sunday roast, the beef, I “allowed” her ask for something else). I ordered the “Slow Cooked Pork Shoulder and Fois Gras Terrine with Piccalilli” (not PC, I know, but the only thing I could eat as I am fussy with starters) and “Roast Rump of 32 Days aged Beef”. The waitress also took our drinks order – a Becks Vier for me (£3.95) and a 125ml of house red for Claire (£4.00). When the order brought over, we were told that they didn’t actually have the measure for the 125ml, so Claire had 175ml for the same price – I should have ordered a glass for myself! 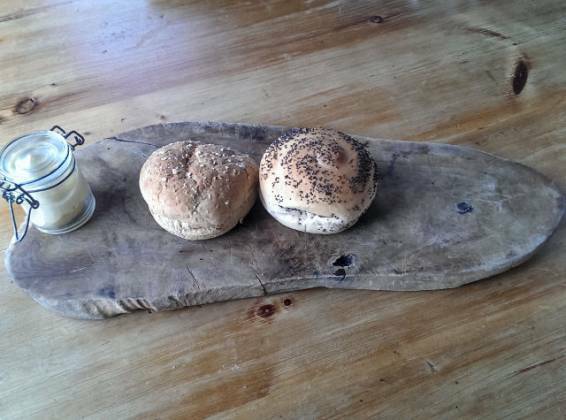 Someone brought over bread for us once we had ordered – two rolls, a white one with poppy seeds and a granary – as well as a small kilner jar of butter a wooden board. We shared each, both were warm and tasty. Our starters came out next, and mine looked impressive! 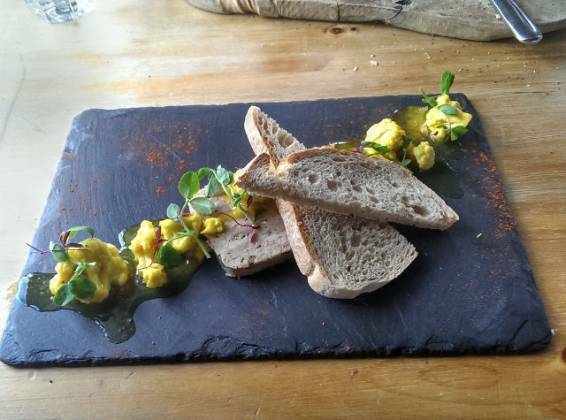 Served on a slate-style plate, the terrine was in the middle with two pieces of bread, with home-made piccalilli. I’m not a pickled food person, so whilst I didn’t like it myself (I tried the cauliflower), I appreciated that others would find it excellent. I enjoyed the terrine though, meaty and creamy. 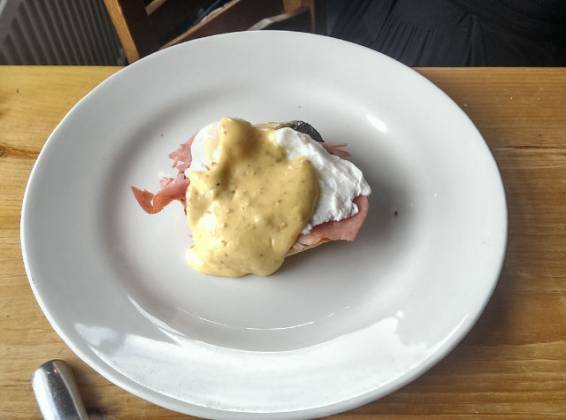 Claire thoroughly enjoyed her eggs benedict. Next, our main course. Claire’s plate was slate, with a small “cup” place in the corner (it reminded me a bit of a school desk, for some reason). 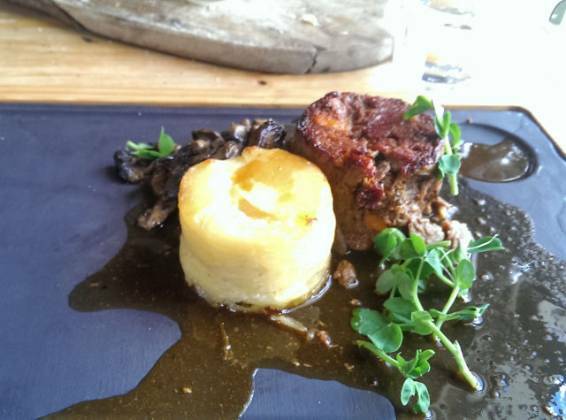 The wild boar in the middle, with the gratin potatoes and mushrooms to the side. This was all covered by gravy (sorry, “Kentish Cider Jus” :)). My roast beef looked excellent – 3 slices of medium / rare beef (how I like it), 3 large roast potatoes, roasted vegetables and Yorkshire, topped with gravy (underneath the yorkie). Tucking in, the beef was beautifully cooked – so tender and with a great texture, with lovely fresh horseradish sauce. It was also a fair-sized portion too. The roast potatoes were pretty much perfect, large and crunchy with a slight brown colouring on the outside. The vegetables were good, both the roasted parsnips and carrots tasted fresh (the flavours really came through for each), and the shredded cabbage was enjoyable. I would have preferred another type to be included (such as broccoli or even cauliflower cheese – shock and horror), but on the whole it was a good serving of veg. 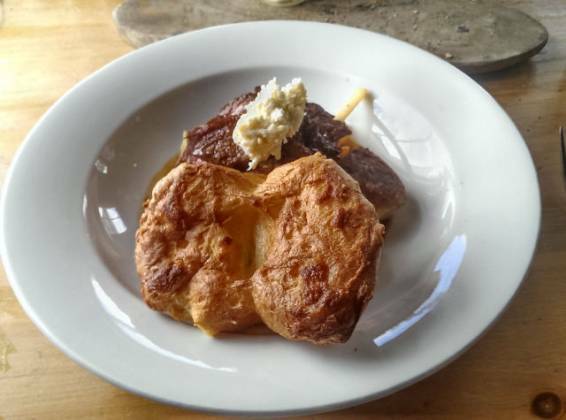 The Yorkshire was nice – obviously homemade, a bit oily but with a fresh taste. Lastly, the gravy – what a great tasting example. Nice seasoning which complimented the rest of the meal. And just enough for the roast potatoes and Yorkshire. I sampled Claire’s wild boar – wow! So tender, like eating a pulled pork dish. The flavour of the boar came through well. Claire mentioned the course had strong flavours coming from each aspect, but it all worked well together (would be nice in the Autumn). After all this, we just had to order dessert (3 courses for £19.95, after all ;-)). Claire ordered the Lemon Posset with shortbread, I had a bit more of an indecision. 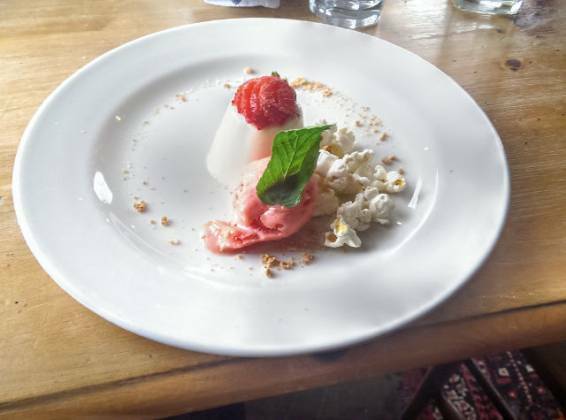 In the end, I decided against the Eton Mess and went for the Popcorn Panna Cotta. 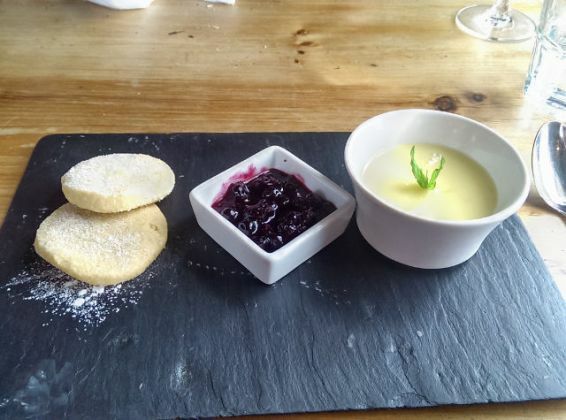 Claire’s dessert consisted of the lemon posset in a bowl, with a berry compote and two pieces of shortbread on the side. Mine was a panna cotta in the middle, with some popcorn next to it(!) and a smooth strawberry sorbet. Both were delicious, the panna cotta was very creamy and I enjoyed the sorbet, but Claire’s definitely won the dessert award today. The lemon posset and very berry compote were gorgeous. She did think the shortbread was a smidgen underdone, but still enjoyed it. 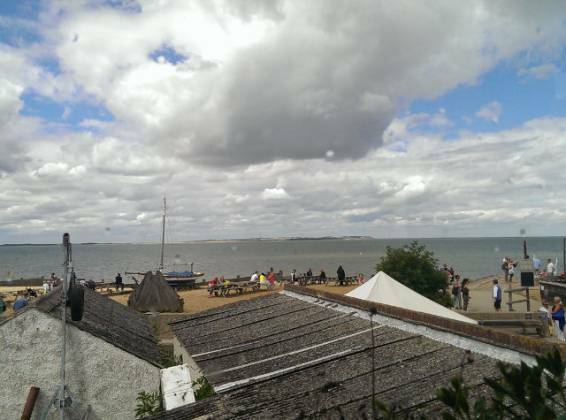 We finished up with a walk and a cup of green tea along Whitstable Harbour. Bliss. So, our conclusion. I felt the staff were being a bit awkward about the pram which put a mild taint on the start of the experience. This (very small) bad feeling completely evaporated once sitting down though – our waitress was attentive and friendly. The highchair wasn’t clean, but we have been told by friends that this is normal with restaurant chairs. Courses came out quickly without rushing us, and it was great value. On the a la carte menu, Claire’s meal should have cost upwards of £30, but with the 3 course deal, it was £19.95. The food quality was excellent, as was the presentation. I would have perhaps liked more choice with the roast, but I do understand that some (insane) people prefer something else on Sunday. The lemon posset was fantastic, as was the view. So, a superb Sunday lunch, and deservedly awarded Top Rated!